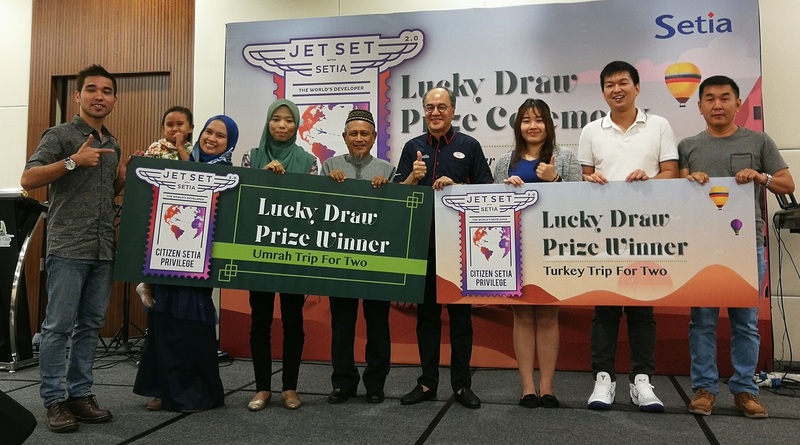 SETIA ALAM (Sept 8): S P Setia Bhd has given away travel packages worth some RM150,000 to seven lucky buyers who purchased a property during the developer's "Jet Set with Setia 2.0" campaign. The campaign saw four Muslim winners under the "Citizen Setia Loves Festivals" segment receiving two tickets to perform Umrah this year while three buyers won two tickets to embark on an adventure-themed holiday to Turkey via the "Citizen Setia Loves Adventures" section. The winners were presented their prizes at a ceremony held at Setia Eco Park here today. Also present at the event were about 60 members of Citizen Setia (purchasers of S P Setia properties). Chai Wen Xue from Setia Eco Gardens, Johor was elated with his win. “This is the luckiest day of my life! I am so happy I made the choice to own a Setia property last year as I have always believed in the Setia brand which is a symbol of trust, reliability and value in the market,” he said. Norfarah Diana Aba, who purchased a home in Setia Alamsari was shocked to be chosen as one of the Umrah trip winners. “It has always been my dream to be given a chance to visit the Holy Land of Mecca and I would like to thank S P Setia for making my dream come true," she said. A total of 438 Citizen Setia were entitled for the giveaway by purchasing a property with S P Setia during the campaign period. S P Setia deputy president and chief operating officer Datuk Wong Tuck Wai said members of Citizen Setia have always had opportunities to experience unique, refined and extraordinary destinations and adventures; and cultural and artistic performances such as concerts, sports, and festivals. He added that the Citizen Setia platform will continue to offer bespoke lifestyle experiences and rewards for those who own a SP Setia properties. As at end-June 2018, S P Setia has 46 ongoing projects, with an effective remaining land banks of 9,587 acres valued at a gross development value of RM155.94 billion and total unbilled sales of RM8.12 billion.